Sumbody gives the consumer a natural and ethically-made skin care range. There is so much to choose from, you must check out their entire range of products on the Sumbody website! Standing behind every scrub, mask, and lotion, sumbody CEO, Deborah Burnes, has a tall but timely order... let's make it pure and let's make it work. sumbody offers serious skin care that is free of synthetic chemicals and preservatives, and that delivers results we like to think of as "supernatural." sumbody is a pure skin care line priding itself on its completely chemical and preservative free, finest quality products. Batch-by-batch, each item is produced by hand, with attention and care, several times each year to ensure the beneficial freshness of each and every scrumptions body treat. Sumbody's signature mint essential oil blend literally revives tired feet! I used this after being on my feet all day at work and it actually soothed my tired footsies. Put both feet into a large bowl filled with warm water. 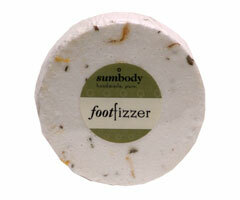 Drop in fizzer and soak your cares away. Sodium Bicarbonate, Citric Acid, Juniper Berries, Calendula Petals, Peppermint Leaves, sum Essential Oil Blend. Tone, moisturize and protect your baby bump! This belly butter is super dense and extremely hydrating. The special pre-natal formula has skin softening and soothing ingredients that help to prevent and heal stretch marks and scars. massage into skin generously to moisturize and help heal and prevent stretch marks and scars. Cocoa Butter, Shea Butter, Coffee Butter, Olive Oil, Avocado Oil, Apricot Oil, Jojoba Oil, Rose Hip Oil, Tamanu Oil, Vitamin E, Extracts of: Comfrey, Chickweed, Violet, Essential Oils of: Mandarin, Patchouli, Rose Geranium Oil.